Dhokla is Gujarati snack, it is made from gram flour and subsequently steamed .dhokla has very low calories,100 gm dhokla contain only 160 calories. 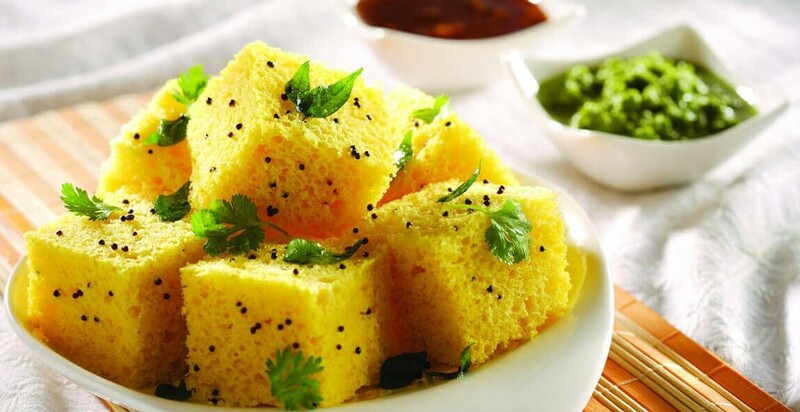 Dhokla has a low glycemic index, which makes it good for diabetics. This is very simple and healthy recipe. First sieve gram-flour and combine all the ingredients, except fruit salt in a bowl, mix well by start adding water to make a smooth batter(not too much thick or liquidy). Just before steaming add fruit salt and mix lightly, pour the mixture immediately into a greased bowl. Steam in a steamer for 10-15 minutes or till the dhokla is cooked, checked with a toothpick. Keep aside, make it tempering. Heat the oil in a small pan, add the muttered seeds when start crackle adds sesame seeds, asafoetida, curry leaves and green chilis and saute on a medium flame for 1minute. Remove pan from the flame, add 1/2-1 cup be careful while adding water as it sizzles stir and add sugar and allow the tempering mixture to come to boil pour the tempering over the prepared dhokla. Cut into square or diamond pieces with the help of a sharp knife and garnish with fresh coriander(cilantro). Serve with green and tamarind chutney. Copyright © 2018 Recipe-Times, All Rights Reserved.